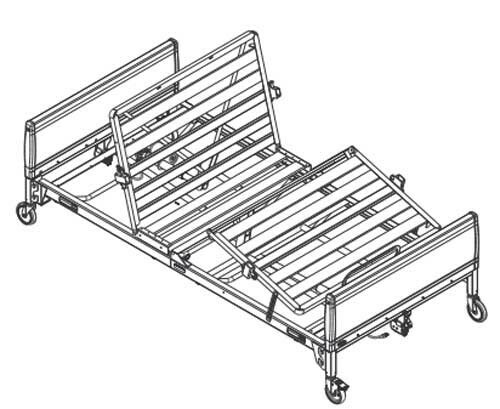 Bariatric Bed BAR600 is a heavy-duty full-electric hospital frame that supports up to 600 pounds. 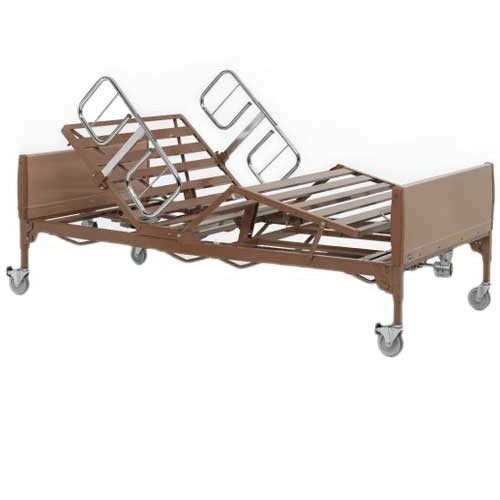 This bariatric bed is designed with a split-spring frame that extends to the edges of the bed deck. The design offers better support than most other bariatric spring beds. 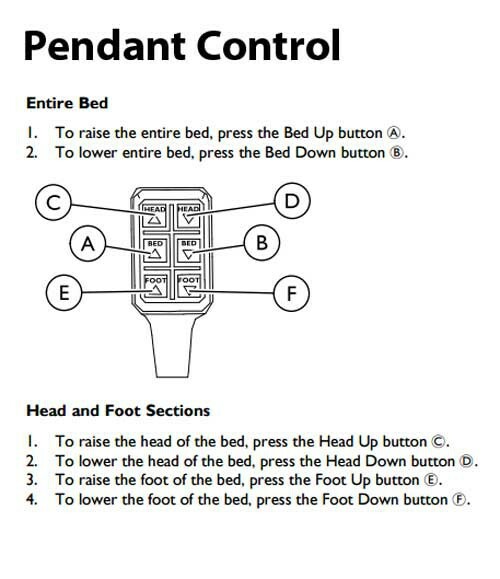 A hand pendant is supplied that controls the bed height and the head and foot mattress sections. 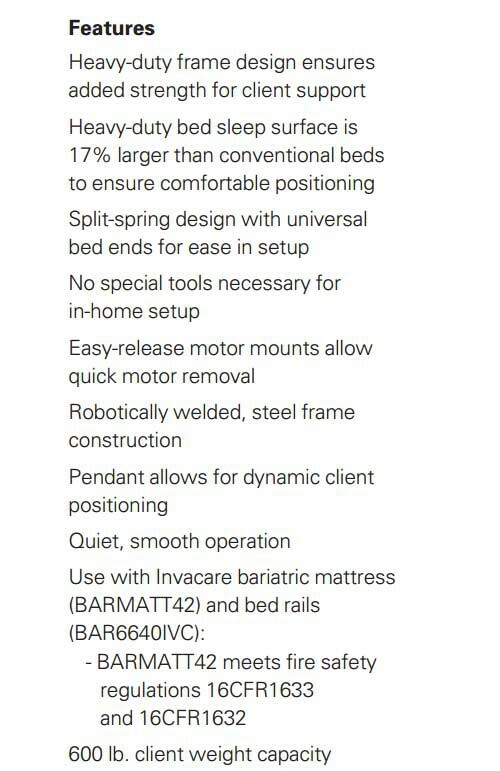 Assembly of the bed is easy without the need of any special tools. The size of this bed is 17% larger than a standard conventional bed to offer greater support and comfort. Constructed with a steel frame, the welds are located at the joints for greater stability. An emergency crank provides the ability to lower any raised sections. If you need assistance moving and setting up your new bed, make sure to select the White Glove Delivery option prior to choosing "Add to Cart." With White Glove Delivery from Vitality Medical, you will have one to two highly skilled technicians that will move everything into your home, assemble it, ensure that it works properly, demonstrate its functionality and how to use it, and will remove any excess packaging upon leaving your home. Background checks have been done on every technician, so you can always rest assured that you're in safe hands. 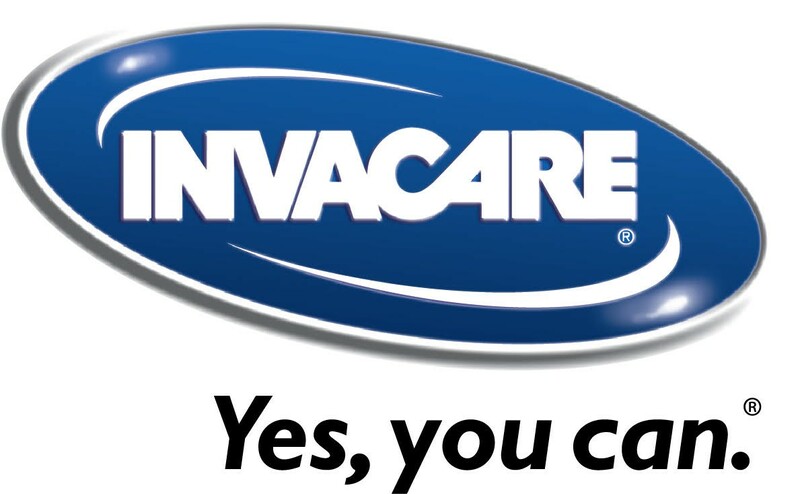 Invacare manufactures many hospital and homecare beds to meet the needs of patients and caregivers. 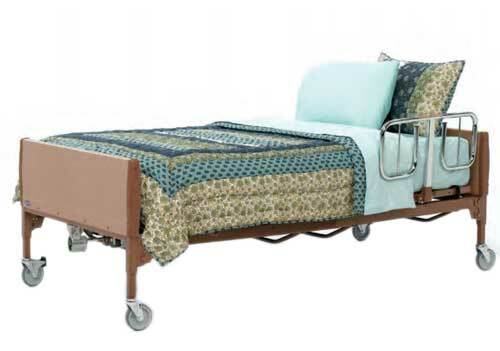 Below are links to additional information about other beds from Invacare. 42 x 80 Inch Sleep Deck. Heavy duty capacity and comfort. 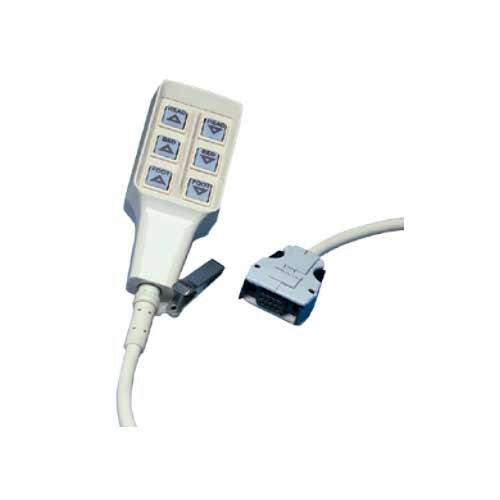 Hand pendant allows for dynamic patient positioning. 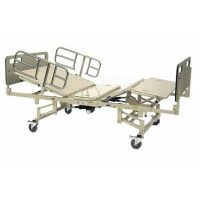 Heavy-duty frame design ensures added strength for patient support. Easy setup without special tools. Four casters provide easy transport from room to room. Bariatric mattresses are made with latex free materials. Manufactured with high-quality foam, these heavy duty mattresses are designed to support bariatric patients. The foam has high resilience and is made to provide extended life. 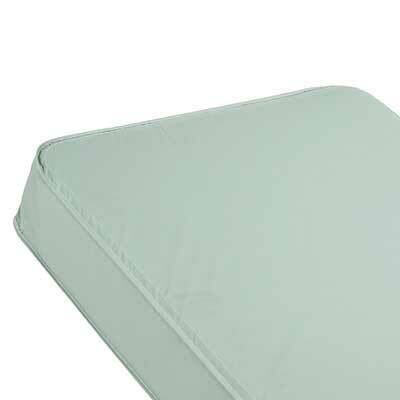 A durable vinyl cover offers protection to the mattresses. The mattress length is 80 inches and the width is 42 inches. The mattress has a solid inner core and is reversible. Complies with Federal Flammability Standards 16CFR1632 and 16CFR1633. 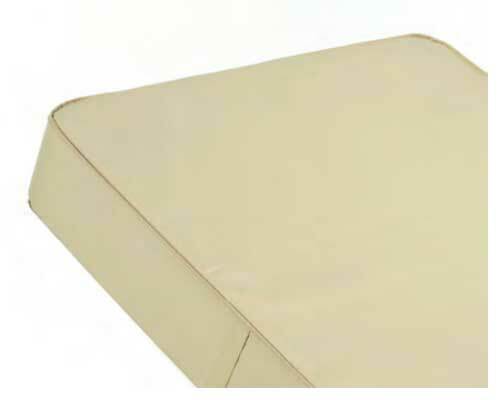 This mattress offers alternating pressure and low air loss to help prevent and treat stage 1 to 4 pressure ulcers. 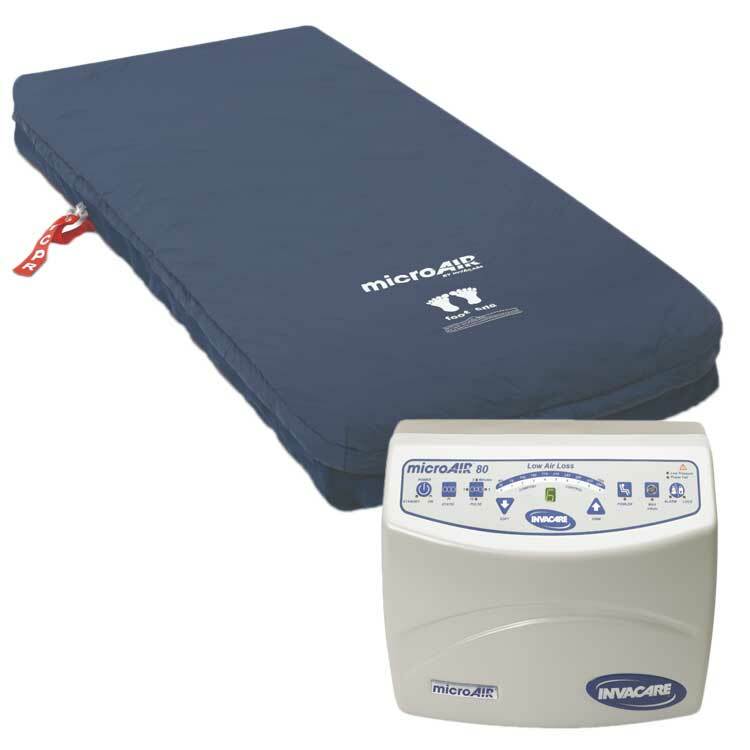 This is a pulsation mattress that offers an additional level of comfort to patients. It offers moisture management and true low air loss. Dimensions: 42 x 80 x 10 Inch. Compressor Output: 1275 liters per minute. Anti-microbial, fluid-resistant, vapor permeable cover. Warranty: 2 years compressor, 1 year mattress and cover. These safety rails are designed to help protect patients from fall injuries. Constructed with steel, these heavy duty rails have 1 inch of steel tubing and are welded for greater strength and durability. The rails swing out of the way for easier entry or exit by activating a quick release button. The heavy duty construction allows the rail to be used as an assist handle, repositioning aide or protective rail. Width: Between rails - 42 inch. 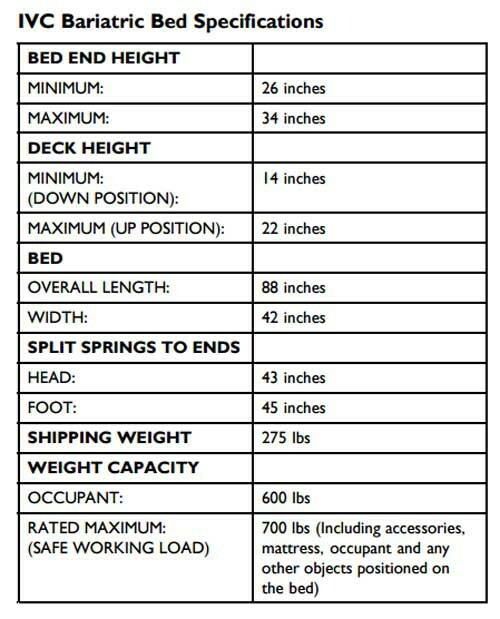 Height: Above deck raised - 15 inch, Above deck lowered - 3.5 inch. This overbed table has an easily adjustable height with a spring-loaded locking handle. 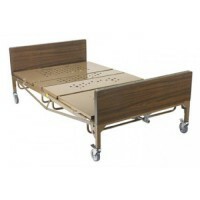 Constructed with a chrome=plated heavy gauge steel, this hospital bed table is very durable. Caster wheels attached to the frame allow the table to roll over your bed. Dimensions: 30 x 15 Inch (table top). Height: Adjustable 29 to 45 Inch above floor. Walnut wood grained laminate top. 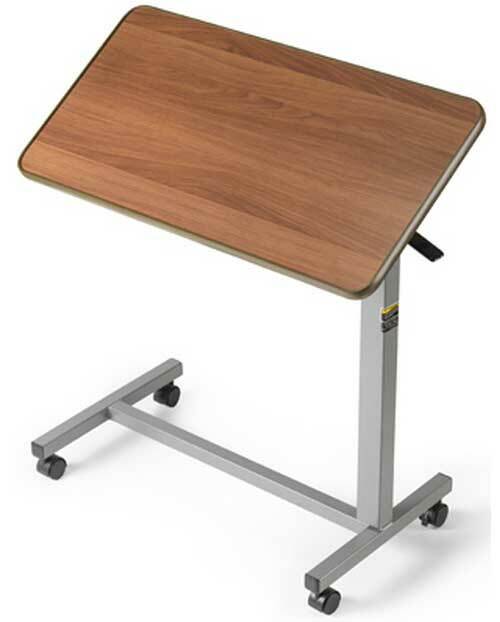 Tilt top tables accommodate reading, writing or laptop use. The tilt and height of the table are easily adjustable with the touch of a lever. The overbed table is constructed with heavy gauge steel that is welded at the joints for greater stability and durability. The table top has an attractive walnut wood grain laminate. Height: Adjustable 25.75 to 39 Inch above floor. Manufactured by Invacare, this Trapeze Bar bolts onto any metal frame headboard or can be attached to the Trapeze Floor Stand (INV7714P) sold separately. Trapeze bars allow patients more independence by providing assistance for changing position or getting into or out of a hospital bed. The hand bar is nylon coated to provide a comfortable gripping surface. 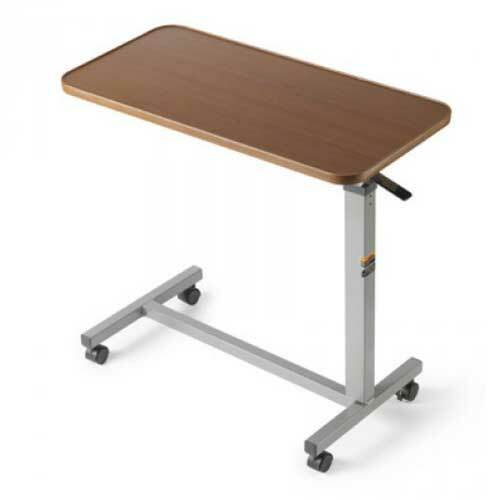 The height is adjustable to meet the needs of individual patients. Diameter: 1.25 Inch octagon tubing. 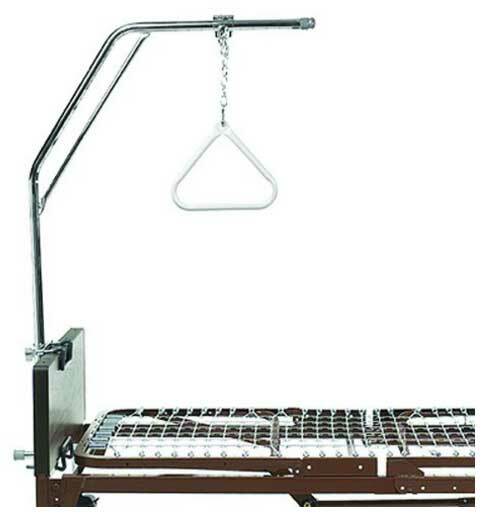 This trapeze bar serves as a transfer aid for bariatric patients. 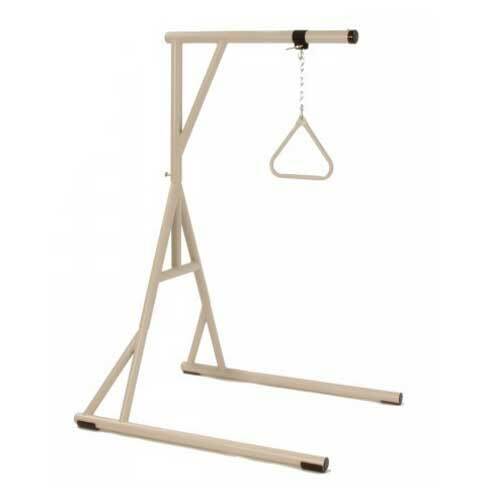 Although designed for heavy duty use, this hospital trapeze bar has a capacity of 1000 pounds and works well in home care or clinical settings. Constructed as a free standing unit, this trapeze can even work with a standard bed. Base: 50.5" (L) x 40" (W). 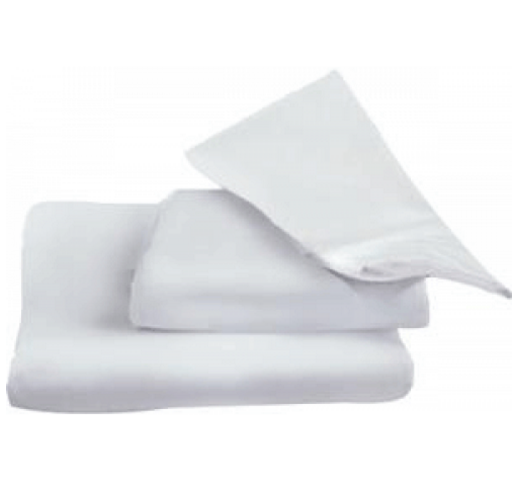 Manufactured by ReliaMed, this three piece hospital sheet set comes with a mattress sheet, top sheet, and pillowcase. 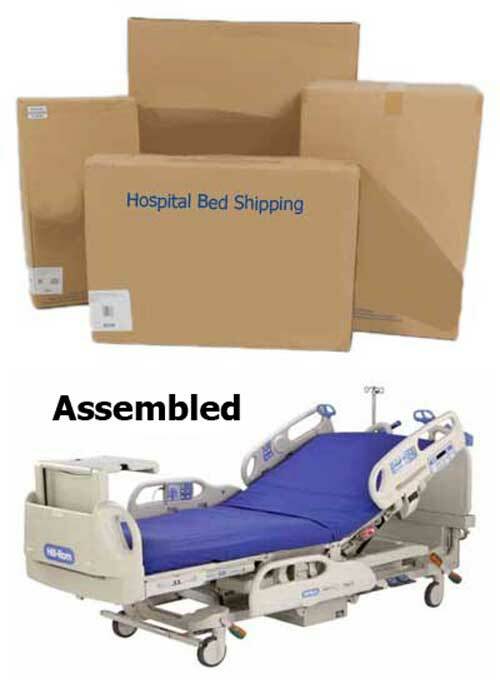 This sheet set is designed for standard hospital beds. The top sheet is larger than a standard top sheet for easy bed making. The mattress sheet is a fitted bottom sheet to provide a snug fit upon the mattress. White Glove Delivery Service includes shipping and full assembly in a suitable room of your choice. This shipping service provides two highly skilled technicians that will move everything into your home, assemble it, ensure that it works properly, demonstrate its functionality and how to use it, and will remove any excess packaging upon leaving your home. Background checks have been done on every technician, so you can always rest assured that you're in safe hands. White Glove Delivery is available by appointment in most states. Once you have placed your order, we will have an associate contact you to arrange a time that complements your schedule for the delivery and set up of your new bed. 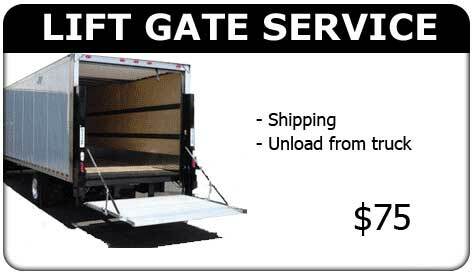 Lift Gate Delivery Service includes shipping and lift gate service. Lift gate service provides for delivery of your shipment to your curb or driveway. The delivery personnel will remove your shipment from the truck to the ground. 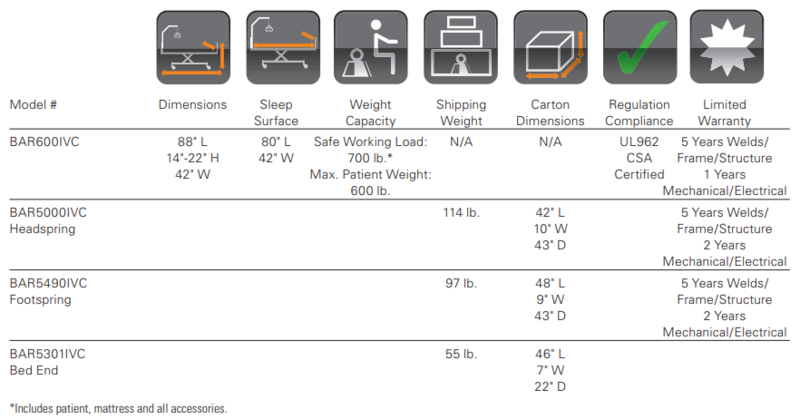 BAR600IVC Brochure describes the benefits for this hospital bed. BAR600IVC Catalog displays the features and options. 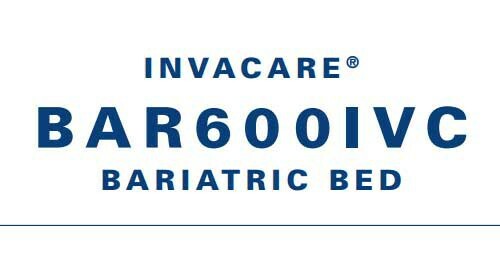 BAR600IVC User Manual offers details about setup, care and maintenance. 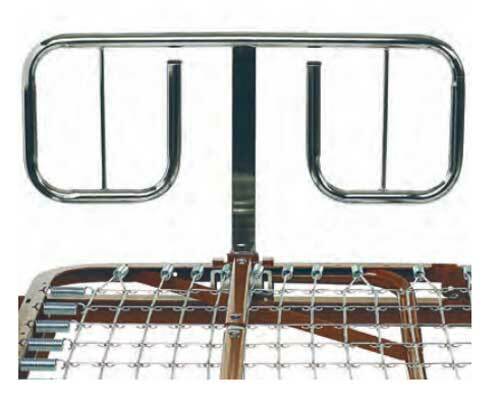 Safety Rails Brochure provides features and benefits. FDA Side Rail Implementation covers hospital, long term care and homecare clinical guidance. Side Rail Clinical Guidance for the selection and implementation of safety rails.